Charming stone house next to Jonzac Chateau, priv gdn wonderful views. A historic, traditional 5 person Town House, next to Chateau, beautiful country views private garden. Free WiFi, modern facilities, private garden and sun deck. On the edge of the hamlet, the perfect location to get away from noise and hustle. Private patio and garden, lots of shade available.Less than 30 minutes from beautiful sandy beaches. On the edge of the hamlet, the perfect location to get away from noise and hustle. Private patio and garden, lots of natural shade available. Less than 30 minutes from beautiful sandy beaches. Set in beautiful 7 acre gardens,a stunning converted stone barn built in 1810, has all the space needed for a large family holiday with 2 further gites onsite for larger bookings(Up to 19 persons). 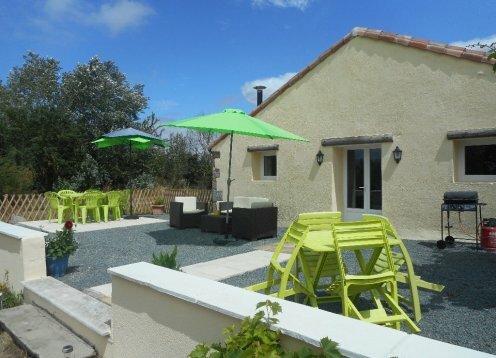 A spacious house with exclusive heated pool in traditional Charentaise style. Ideal for a large family and those needing some wheelchair access.